A communal diary filled with notes on our everyday life in Northern Nicaragua. I experienced the last month here in fast forward. Two of my closest friends, Sarah and Anique, visited for a week and we had a fabulous and crazy adventure...we traversed volcanoes (well, almost), laughed at all the silly and ridiculous things that happen while traveling in Nicaragua, slept in cots made from plastic sacks, spent time with our friends in San Ramon, acted as tourists for my English class to test their speaking and practiced our hip-hop moves. They were with me when I received news of my acceptance into the Women's and Gender Studies Ph.D. program at Rutgers. Since we were together in the Master's program at Rutgers, they were exactly who I needed to be with to think through some major decisions. Sarah and Anique also helped to initiate a project that Damaris and I have been talking about for the last few months. Isn't it always the case the you really feel at home somewhere just when you are about to leave? Within the last two weeks, Damaris and I began developing the much discussed project focusing on gender inequality, reproductive health and the youth in San Ramon. We have been working non-stop on designing the program and writing a proposal. I also signed on to help find funding for a larger program that would increase people's access to conventional health care and natural medicine in San Ramon and the surrounding rural communities. Writing grant proposals is challenging. Writing proposal in Spanish and translating them into English, even harder! But, I have been happy working and being involved in a creative process. The days have been full (I also started running again, which meant setting the alarm for 5:00am every day). There have been moments over the last 8 months (many, in fact, mostly when I was sick) when I felt like I would never be leaving Nicaragua; that we would be here forever. But, this last week I felt my departure looming in the distance...like someone throwing a snowball at you and watching it beam at your face in slow motion. Today, it hit me. I started my last day with an early morning run, watching the sun rise over the mountains. On the dirt road, the chickens, pigs, and dogs were just beginning their daily routine of finding food. Moms were sweeping their porches. Just another day. I finished up last minute packing and last minute meetings about the proposals and projects. Over the weekend, I had two surprise "despedidas" or farewell parties, so saying goodbye has been a long process. But this morning was hard. So many people have welcomed us into their homes and lives, shared their dreams and suffering. We have gotten to know a diverse group of people, from the crazy young guys in my English class, the staff at the Casa de Ninos, our neighbors, to the entire Izaguirre family. The richness of my experience has come from knowing all these people. When I left this morning, I felt like I was walking out of a warm embrace. Water looks different running out of the faucet when you know that it has an end. In fact, the whole idea of a faucet begins to seem ridiculous. 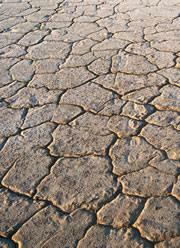 You cannot see how much water you have used or how much is left; it almost implies the existence of an endless source. Water has been one of the greatest challenges of living in San Ramon. Endless, clean, temperature controlled water does not exist. Having access to water is not a given, and clean, drinkable or hot water is a luxury. In the rainy season, the city water is turned off during heavy rains to prevent contamination (in November we lost water for 4 days). In the summer, the water is randomly turned off during the day to conserve. We luckily have a huge cistern that automatically fills up when the water is turned back on, leaving us a reserve during the day. The issue of access to water is most difficult for those with less resources. Cleanliness is another concern. The tap water is not potable. All the things I was used to doing mindlessly at home in the U.S. (flipping on the tap to brush my teeth, washing vegetables, grabbing a glass of water) suddenly become more complicated (my sensitive stomach requires me to be even more cautious). Water that is consumed has to be purified water (we buy big jugs every week) or it has to be boiled. For me, dishes have to be completely dry before being used. Washing fruit and vegetable is tricky (a lot of people use bleach). Needless to say, people are very conscious of their water consumption here. I have been catching myself more and more in the midst of wasteful North American habits. The other day I was talking to a friend as I washed the dishes. I let the water run in between soaping up. I realized my mistake when I saw her anxiously looking at the running water while trying to carry on the conversation. I feel guilty for taking water for granted and even more guilty when I feel excited about going home so I dont constantly have to worry about it. Brad and I recently watched a documentary about global warming. One of the issues it addressed, simply put, was how access to clean water will become increasingly hard (for everyone) as global temperatures rise (for example, by causing water reserves in snow to melt). Another effect will be the rise in tropical diseases because winters are getting warmer and warmer. These kinds of documentaries have always alarmed me, but living here (in the context of these problems...tropical diseases, access to water) has put a fresh face on these environmental concerns and pushed me to think about how comfort makes us complacent. Working at the Casa de Niños has been a much needed breath of fresh air. I am surrounded by strong, fun and resourceful women. The organization was founded by 26 women in San Ramon following the war of the 1980s. These women saw a great need in their community and organized...since the 1980s the organization has grown to provide a variety of services. True to it’s original mission, the organization works to help children realize their value and potential. One of the children from their first painting classes, now grown, has won the national painting competition three years in a row and started a painting school in Matagalpa. The Casa de Niños even has a program for the ¨Viejitos¨(old people, in an affectionate way) every 15 days. These are the oldest of the old in community and they get together to sing, dance and do crafts. Every time I see the group I can’t help but smile and chuckle. They even elect a king and queen for the group every year. Next time they meet I am going to try to take a few photos. For now, here are a few other pictures. Above, I am standing in front of the pharmacy which was painted by some of their students. 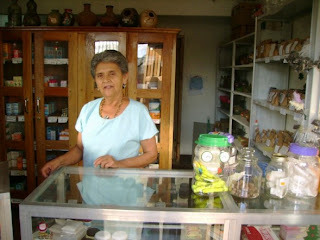 Doña Margarita is one of the founding members of the organization and runs the pharmacy.She is incredible. Anyone that meets her can sense her strength right away. She has raised 9 children, received only a 2nd grade education, she became politically active leading citizen groups during the revolution and was just elected to be the president of the Casa de Niños. Doña Margarita readily affirms that the organization is run by women...the men working there are only helping out. In a place where women’s and men’s roles are clearly defined (women have babies and take care of them and the house) she is constantly pushing social boundaries. The other day, Brad stopped by the pharmacy for a visit. We began discussing with Doña Margarita the importance of her new role as president. A young man walks into the pharmacy. Without pausing, Doña Margarita continues explaining that men often think that women are just there to cook, clean and have their babies. She implicates this young man in the conversation by making eye contact. This attitude, she continues, is inexcusable and she has always encouraged young women to have independent identities. In a place where Machismo is often the white elephant in the room, Doña Margarita has no fear directly addressing it. The guy looked uninterested, but at least we know he heard her! Mom and Dad Wilson (Becky and Frank) recently visited us here in Nica, completing what has been a whirlwind tourism season for Tus Hijos (formerly Tus Hermanos) Tours. Sign up for your tour by contacting our hotline - prices are rising so call soon. For about 10 years I have been coming back and forth to Nicaragua. Now after all these years my parents got a taste of what keeps me coming back. No, not the coffee. Cynthia and I had a great time introducing Mom and Dad to some of our favorite people and places. We started our trip walking the streets and boating through the isletas in Granada, then took the plunge in Laguna de Apoyo. After a humorous trip north listening to David Sedaris tell stories about his own family, we arrived in Selva Negra, just in time to take a tour around the coffee farm which first sparked my interest in rural development. After many years of hearing stories about Mausi Kuhl (my host in La Hammonia 8 years ago), my parents finally had a chance to meet face to face. The next morning we took off for San Ramon, linking up with our neighbor Sebastian and his younger brother Marvin to tour their coffee farm La Hermandad. The introductory photo and the photo above were taken in La Hermandad (The Brotherhood) an 80 manzana farm 20 minutes outside of San Ramon. In the picture of the boys you´ll see from left to right Alvaro Izaguerre, Marvin Mairena, Bradley, Frank and Sebastian Mairena. It was really special that my parents visited the farm because our neighbors have become very close friends of ours and also they are one of only a few success stories I have come across in my research. La Hermandad is a cooperative farm business composed of 10 family members and 8 community members. Living through a time of great hardship (war, usury, little income) in the 1990s they were able to buy and develop their coffee farm into a beautiful business employing up to 15 permanent workers and 80 temporary harvesters. My Dad and Sebastian chatted business with me translating. Really fun. My parents commented on the range and depth of the experience that they had in Nicaragua, from the time in Managua and Granada to the mountains of San Ramon. Everthing fell into place. And in such a short time. You´d be surprised to know that we had 4 full days to cover all the ground which we covered! Last week my brothers and sister-in-law toured Nicaragua with us in tow. As anyone who knows Tyler and Jason can imagine, the visit had us doubling over with laughter. We loved it. Where shall we begin? For starters the five of us arrived in Granada on what was probably the best day of the year. Weather and action-wise. Granada was host to an international poetry festival which had attracted some of Nicaragua's most famous writers, and moreover the city had gone out of its way to make the evening exciting. After checking into a wonderful hotel that Tyler had scoped out online La Gran Francia we walked out on the famous 500 year old central square that makes Granada a major tourist attraction. Who else is singing on-stage at the festival but none other than Carlos Mejia Godoy the most loved and renowned Nicaraguan singer, musician, cultural icon and songwriter. Not much later we had the great luck to see Ernesto Cardinal, poet laureate and renowned Latin American poet-writer, read a poem. He is aging so this may have been a once in a lifetime opportunity. After the group had enough with the poets spraying words in a language only 1 out of the 5 of us could understand, we looked around at kiosks and tables of artisan goods, searched unsuccessfully for good cigars, and dodged a sketchy huckster named Ricardo who Jason and I have encountered in similar parasitic-like experiences. Ricardo is a fluent English speaker who hangs out in the Hotel Alhambra where he is employed - the equivalent of a cruiseboat entertainment director - wearing high-guy white shorts, green vertical stripe shirts and all. Jason and I know enough to stay away. Right before dinner - Tyler, Jason and Michele witnessed what we could only decipher as large-scale puppets - the traditional big lady and head man puppets - doing the dirty symbolically on the main street outside of the hotel. Oh yeah, there are pictures to prove it. Tyler threw a dollar. After dinner we got to business finding a good bar and good music. We landed in Cafe Nuit to see some local acts from Managua. Sitting next to us was the lead singer from the band PerroZompopo (DogLeaf-CutterAnt), whose name is Ramon Mejia. We had no idea who he was. People just kept coming up to get pictures and signatures. Jason leaned over and said, "Well you must be famous, but I don't know who you are." Ramon's Italian girlfriend entered the conversation to resolve the international dispute. Friendship blossomed. We got Nicaragua's hottest new singer's cell number. That night after the live music the three fearless travelers - sans Bradley and Cynthia - cruised the lake-side strip to go dancing at one of the local bars. More humor ensued, something about large beer bottles, hypnotic drinks and Tyler testing his sign-language. Everyone went to sleep content. We were all in Nicaragua together. Amazing.